The comfortable holiday domain Souillac Golf & Country Club can be found between the forests of the Dordogne valley. The vast domain is beautiful and situated around the (18 hole) golf course. It consists of eight neighbourhoods with 6 to 18 luxurious chalets. Each neighbourhood has its own swimming pool! Included in the price are the use of bedding and towels, as well as the final cleaning! You're in the Lot here; a fantastic region for a versatile holiday. Historical towns like Sarlat and Rocamadour, prehistorical caves, many sports possibilities at the Dordogne river and of course the regional cuisine with its matching wines guarantee a great holiday. This park enjoys a very quiet and rural location between the forests. The town of Souillac is about 8 km away. The town of Rocamadour (31 km), built on the rocks, and the medieval market town of Sarlat (28 km) are certainly worth a visit. In the area you can also go canoeing on the Dordogne river; you can go horseback riding and of course golfing on the beautiful golf course (18 holes, designed by Jeremy Pern). 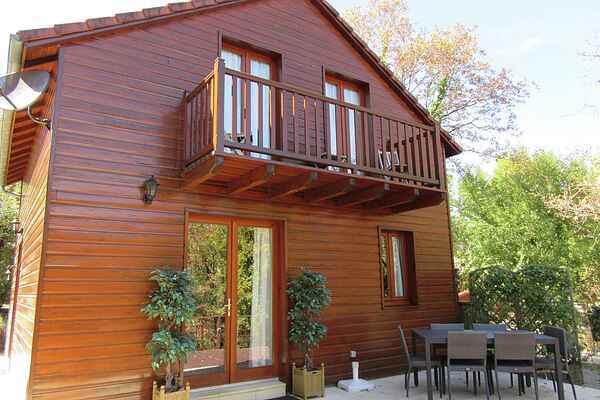 Four-room chalet (detached, up to 6 people). Area approx. 74 m2. Living room with dining and seating area, satellite TV, DVD player, WiFi (free) and heating. Open kitchen with 4 hobs, fridge, dishwasher, oven, microwave, coffee machine, electric kettle, toaster and washing machine. Bathroom with shower and toilet. Upstairs: three bedrooms; one with a double bed and two with 2 single beds. Bathroom with bath and toilet. Balcony, terrace and open garden with furniture. You will also have your own parking space. There's a central reception. All eight neighbourhoods have their own swimming pool (open from late April - mid-October; depending on the weather - the swimming pool heats the water a few degrees above the actual temperature). There also is a central swimming pool and two separate children's pools. You can also use the facilities of the Country Club, like the bar, the restaurant, the tennis court (for a fee), the boules court, table tennis, the volleyball court and of course the golf course. As a guest you will get a 20% discount on the green fees. Finally, you can also rent a gas barbecue. In July and August there's a Cityjet flight from Amsterdam to Breve; the airport is only about 20 minutes from Souillac Golf & Country Club.